A seven-year study on Bhutan’s geo-dynamics from 2011 to 2018 by a combination of internal and Bhutanese experts showed that Bhutan is due for a big quake of 7.5 to 8 magnitude since the last quake of that size was seen only in 1714 and so pressure has been building on the plates. In geological parlance ‘due’ could mean anything from a few years to a few hundred years but the study meant that Bhutan will have to be prepared. Now a separate study and report titled ‘Resilience Strategies and Perceptions of the Potential Impacts of Earthquakes in Bhutan,’ identifies the major risk areas for Bhutan in case of a big quake and what can be done to strengthen resilience and recovery. The report is based on interviews with various institutions and individuals in Bhutan along with collection of data. Though Bhutan is due for a big one most of those interviewed anticipated quakes of the 6.9 Mongar earthquake in 2009 and the 6.1 Sikkim quake in 2011. According to the report, the greatest concern was with regard to the collapse of building structures, with subsequent effects on human injury, and reduction in housing and shelter. Bhutan has adopted the Indian building code, IS 1893, and adopts the standards for their Zone 5, which is the area with highest seismic activity. However, the report points out that seismic design was only made mandatory after 1997, and therefore buildings which pre-date this time may not have been built to this standard. The report point out that more than 66% of the buildings in Bhutan are built using traditional construction methods such as rammed earth or stone masonry. It says the wide walls with more than 1meter thickness at the base are created by compacting earth, and are believed to provide safety. However, in what is a matter of concern, interviewees reported that there has been a gradual decrease in the width of walls, which is believed to be related to costs. This narrowing of walls is also believed to reduce the resilience of buildings to earthquakes. Currently, the Bhutan building code does not provide specifications for these traditional structures. Interviewees also reported less inspection of traditional construction methods in rural areas compared to urban areas. The report outlines that since public buildings are required to achieve a higher standard than houses, schools, hospitals, government buildings and public venues built since 1997 will be more robust than houses. In terms of impact of a major quake on road and transport, road engineers interviewed in the report perceived that the impact on roads and bridges will mean that road transportation networks will be cut off. The road engineers expected that there will be multiple blockages due to landslides, impacting on major roads like the national highway as well as minor roads. The report says the main Paro–Phuentsholing highway carries a lot of goods, so a blockage could limit a major land-based access route to Bhutan. Another pinch point is the Wangduephodrang bridge. In interviews, it was suggested that roads could be cleared hours after a minor earthquake, however due to the nature of roads in Bhutan, a major earthquake could severely disrupt main highways, requiring longer periods to repair. Bridges are also vulnerable as there are 361 motor able bridges, and a further 420 non-motor able bridges. A series of Bailey Bridges could be installed to repair roads, however they have a maximum span of 160 feet, beyond which a pier is needed. The report says the impact on the runway at Paro airport will depend on the proximity of the earthquake and the effect on the soft sediment in this broad valley. Another area of concern is telecommunication. Though Bhutan has 650,000 mobile numbers and 20,000 land lines an interview with a telecom companies indicated that a major disaster would likely disrupt the servers which underpin the mobile telephone network. There was some suggestion that internet servers were more resilient than the telephone system, so that a situation might arise where social media apps might work when phone calls would not, providing at least some methods of communication. The process of sourcing parts for and reinstalling the mobile network was estimated to take six to seven months. Dzongkhags have been provided with satellite telephones, but recent experiences showed that these take longer to activate than anticipated, and crucially, require a phone call to be made to Singapore during business hours. The report also said that it was reported in the interviews that after the Nepal earthquake there was dust in the air which hampered the phones’ connectivity. It says that communications will depend on electricity and generators present in each Dzongkhag’s telecoms office. It says the limitation will be the amount of fuel that has been stockpiled to keep these running. It says the health service is primed to treat injuries from earthquakes, which will include physical injury from collapsed buildings, but also injuries arising from the secondary effects of earthquakes – fire, electrocution, and falls. However, the health services acknowledge they have limited capacity to administer counselling and psychological support. In terms of food supply the report overturns the ‘urban notion’ that rural areas will not be affected in terms of food supply. In some areas, farmers have specialised in growing particular crops for market rather than staple subsistence crops. Although some rice is grown, the country still relies heavily on rice imports from India. It says wealthier households can purchase stores of rice while poorer households were reported to be buying rice more frequently due to financial constraints. Farmers also rely on road transportation networks to take their products to market, and to bring in inputs such as fertilisers. Road closures would limit this. In an eye opener though the Food Corporation of Bhutan (FCB) has a series of depots across the country, and a larger depot in Thimphu, they all have limited stocks. The practice of keeping food reserves varied among households, with some households assuming that it would not be necessary as the road will be opened and the government would have reserve rations. The report found this was in stark contrast to responses from some regional government offices, which said they did not have any food reserves at all. The report said it was not clear that there is a strategy concerning how water is delivered to households, and waste water removed after an earthquake. Towns like Thimphu, have a less clear layout of water sources and pipelines. At Thimphu Thromde, concerns were raised about the lack of centralised information about the location of main water pipes and the distribution network. Such information is held by individuals who have helped develop water distribution systems as houses have been built, but is not in a format to be passed on when those holding the information retire. It is believed there are some main lines 30–60 cm below the ground. In other interviews, it was pointed out that each of the 4 major towns, Thimphu, Phuentsholing, Paro, and Gelephu are located on a river, and so there would be fresh flowing water whatever happened. It was also noted that following the 2011 earthquake some water sources dried up, and others emerged, due to ground movement. Thus existing sources on which people rely may change. The report points out that in case of road blockages there were only around three to six days of fuel, that might last nine days if rationed carefully. A further issue identified was the structural stability of fuel depots, and whether they would withstand an earthquake. It says that energy from hydropower stations could be disrupted if an earthquake impacts on the station or if the distribution lines are impacted. An earthquake was perceived to impact on tourism in several ways. 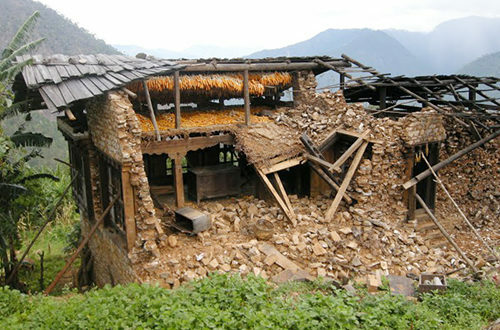 Tourists may cancel visits, buildings such as hotels and homestays could be damaged, and closed for some time while awaiting repair, those reliant on income from roles in the tourism sector may find that there is no or reduced work for some time following an earthquake, so reducing their income. For those tourism-related businesses who have taken out loans, there may be further problems with repayment if the income stream is reduced or stopped altogether. Other businesses may be affected by reduced customer demand and difficulty getting supplies. The report also looks at a timeline of impacts. It says the immediate impact could be damages to buildings, hospitals, communications and water and sanitation. The cascading impact would be in terms of a glacial lake outburst, landslides, fire; depletion of energy sources like fuel and access to safe drinking water, food and safe shelter. The longer term impact would be on governance, education system, local businesses, hydropower and government revenue and tourism. The report said that the impacts which are specific to earthquakes will require additional strategies and resources for resilience building. This report arises from the Building Bhutanese Resilience Against Cataclysmic Events (BRACE) project funded by the UK’s Global Challenges Research Fund. The report was researched and compiled by Frances Harris, Fergus Lyon, and Kuenga Wangmo.